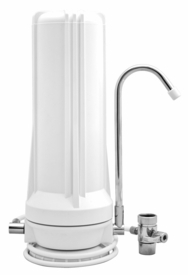 A 1 stage counter-top water filtration system that generates clean water from tap water (chlorinated or non-chlorinated water supplies). It sits on the counter and connects to the kitchen faucet. This countertop filter will not connect to pull out kitchen faucets. If your main kitchen faucet is of the pullout type, you will need an undersink filter system. This system is pre-assembled and it comes with faucet adapter. The system is potable; it can be disconnected and moved to a new location. The system comes with a standard 0.5 micron Carbon Block cartridge 2.5x10� installed. Carbon filters will remove - by adsorption- chlorine, taste, odor and organic matter. This cartridge will also remove sediments larger than 10 microns. It should be replaced every 6 months. If your area has bacteriological quality problems or not chlorinated, then we recommend buying a 2-Stage filter system. A Wrench may be needed for filter housing removal. This unit is ideal for people who move around a lot or are renting and cannot install a permanent system. The diverter valve will fit onto almost any kitchen tap. Once you have connected the unit to the kitchen tap all you need to do when you want great tasting filtered water is turn on the tap diverter and the COLD water tap. Once water has been filtered, inert and desirable minerals like magnesium, potassium, chlorides, and fluoride are left behind. If you have a specific chemical contaminant that you want to remove from water then we suggest that you consider the undersink three stage filter system.